The things that stick in your head after reading a book are often interesting. For example, just yesterday I posted a detailed review of Miserly Moms that outlined a ton of useful tips for cutting domestic spending. Yet, the thing that stuck in my head for days after reading the book was an offhand comment she made about buying garbage bags. She pointed out that these were an item that one could easily switch to generic, since the low-cost garbage bags are a great way to save money. My response to that? Not in my world, it isn’t. We bought low-end garbage bags once. Of the first nine bags we used, two of them ripped and dumped their contents all over our kitchen floor on the way to the trash can. Each mess took at least ten minutes to clean up – one mess was almost entirely dry stuff, so it was fairly easy, but the other mess involved some sticky items, including a glass bottle that cracked and leaked some maple syrup on the floor. The time lost cleaning up these messes almost immediately ate up the “value” we got in buying the low-end brand versus the price we would pay buying better bags in bulk. Since then, we’ve stuck to the brand we trust – Glad Forceflex tall kitchen bags – which have won garbage bag comparisons in both Real Simple and Consumer Reports. We can get these bags in bulk for about eighteen cents a bag, compared to roughly fifteen cents a bag for generic. Given that we have, in three years, only had one breakage of our preferred kind of bag, we’ll stick to our preferred brand, thank you. Whenever I make a comment along these lines, people almost always suggest not filling the bags as much. “If you only filled the generics 80% full, then you wouldn’t have the breakage!” Well, let’s look at that scenario. If I have five 13 gallon bags and I fill each of them 80% full, I’ve got 52 gallons of trash. On the other hand, if I have four 13 gallon bags and I fill each of them to the brim, I have the same amount of trash – 52 gallons. So, I can either use five generic bags (which cost fifteen cents a pop), empty the trash 25% more often, put more plastic into the environment, and spend a total of 75 cents, or I can use four of our preferred bags (which cost eighteen cents a pop), put less plastic into the environment, and only spend 72 cents. In the end, though, the take-home message has nothing to do with grocery bags. Instead, it has to do with finding your own maximum value. 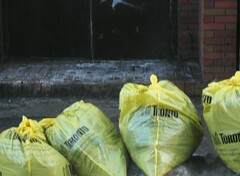 For us, the best value in garbage bags doesn’t come from buying the generic bags – in fact, with most of our household supplies, we’ve found that simply sticking with the Consumer Reports Best Buy provides us with an item that’s not much more expensive than the low end option (and sometimes cheaper if we can find a coupon) and doesn’t have usability problems like not getting the dishes in the dishwasher clean or dumping garbage all over our kitchen floor. For us, a product that does its job well without such crises has a greater tangible value than one that tends to fail on occasion. We’re willing to pay a little more for easier use and fewer failures because of the time factor – cleaning garbage off the floor because we bought the cheap bags is time that we don’t get to spend with our kids. Even better, when we start evaluating the situation as a whole, incorporating some of the costs incurred by poorly-working products (like the bad dishwashing detergent, which causes us to run another load of the same dishes, eating up water and another batch of detergent), we often find that the “cheap” item actually ends up being the expensive one. Our perspective? Find the best price you can on quality items that actually do their job well. Over the long haul, the convenience of items that actually work all the time will add up to enough to make the difference between the prices, even if you don’t see that factor directly in play. If you think I’m giving the generics a bad rap, let me make it clear: by all means, try the low-end items. Find out for yourself if they really add up to the total value that you want. For us, it’s rarely worth it.